There’s already plenty of articles out there listing the best downloadable apps for mobile hacks, including a particularly fine Android-specific list from our very own Daniel Masoliver. But it struck me that a significant number of the apps I use most often for everyday journalist-ing are the basic spec ones that come as standard with the iPhone 4. It’s about time these old reliables got some love. So here, in no particular order, are a few of my most-used vanilla apps on the iPhone, interspersed with the odd anecdote illustrating a time when my trusty Apple buddy has swooped in to save my professional bacon. Whether it’s a last-minute interview or an assignment in foreign lands, any journo will sooner or later end up in the position of needing desperately to be somewhere, and not being entirely sure how to get there. 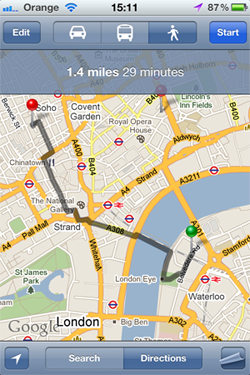 Enter the iPhone Google Maps app. Enter a Start and End location, and the app will calculate how many miles you are from your destination and how long the journey will take by foot, car and public transport. It also draws a Sat Nav style line from one point to the next, so that even if you’re absolutely lost, all you need to do is follow the blue dot on your screen. Admittedly, you look like a bit of a knob as you walk along the street, but at least you’re a knob who knows where you’re going. I very rarely bother looking up directions to anywhere before I leave any more, because I’ve become so reliant on this little beauty. Over Christmas, I was in New Orleans for a journalistic trip and, on my last day, managed to get staggeringly lost in the narrow, time-warpy streets of the French Quarter. Had it not been for my beloved iPhone, I would have missed my flight. Thanks, Steve. Unless you happen to be AA Gill, a dictaphone is perhaps the number one must-have for any working journo. Even if you’re a shorthand whizz, recording interviews is essential both for accuracy and for insuring yourself against being sued. 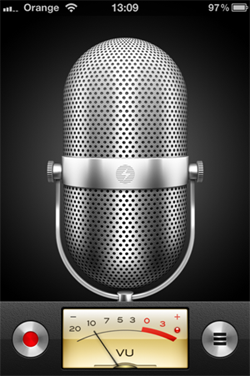 Nothing can replicate the functionality of a real dictaphone, and I would always recommend one of those over an app. 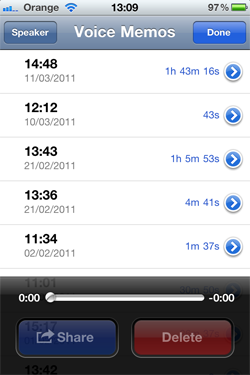 But if you find yourself in a jam (or an off-the-cuff interview) you can turn your iPhone into a dictaphone using the Voice Memo app. Once you finish a recording, the audio is saved to your iPhone’s hard drive and will sync automatically into your iTunes library next time you connect, making backing up your interviews a breeze. One time, I spilled sparkling water on my dictaphone half an hour before I was due to interview someone. No lie. It was busted, and I was screwed. Or I would have been, without this bit of iPhone functionality. Thanks, Steve. Not fancy, this, but it does what it does very well. A journalist is always thinking – poring over story ideas, deciding on which contact to call, trying to come up with the perfect intro. Mental notes never last, and while in theory I love the romantic idea of carrying around a notebook to scribble down musings and ideas as they come to me, getting out an actual pen and paper when you’re laden with bags or sardined between commuters on the Tube just isn’t practical. Instead, I make my notes on Notes. The functionality of this app really isn’t great, if we’re honest. You start a new note, you type it up using the normal virtual keyboard, you save and it’s added to your list of notes, which is organised by Last Modified. That’s about it. 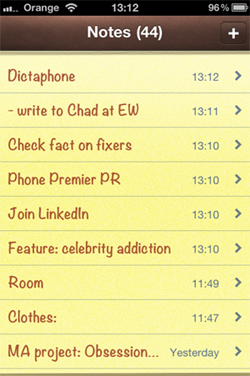 You can’t sync these notes with your laptop, which seems to me a pretty obvious area for improvement on the iPhone 5, and you can’t even change the colour from that vaguely nauseating post-it yellow. 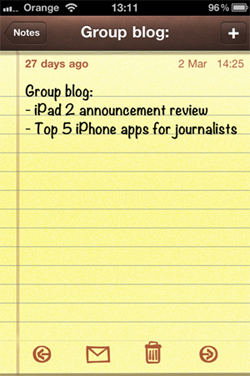 Still, I use it constantly, for to-do lists, for planning out articles in bullet point form, and for that it deserves the number three spot. Do you have a fave built-in app that hasn’t been mentioned here? Do you love the Stocks? Are you mad about the Weather? Drop us a comment below.